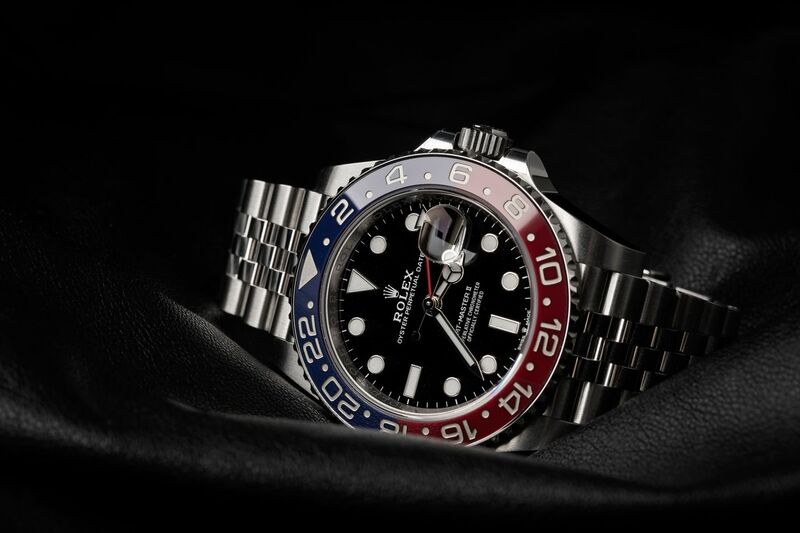 Baselworld 2018 was all about new Pepsi GMT releases from Rolex and Tudor, and while nobody knows exactly what Rolex is likely to bring forth at this year’s Baselworld, the speculation has already started as to what we might expect. Will this be the year of a new Submariner design? Will the Explorer II be granted a somewhat overdue update? And isn’t it about time for a Cerachrom bezel Daytona with a gold case and bracelet? Some of the most vociferous gossip amongst devotees surrounds the brand’s fabled GMT-Master collection, with 2019 marking 65 years since it made its debut. Rolex enjoys a good birthday blowout as much as anyone, and many fans are hoping the brand’s gift to us all might be the one thing that has been notable by its absence in the range for years: the black and red, “Coke” bezel. Now, nobody would be more delighted to see the return of ‘the Coke’ than me, but sadly I just don’t think it is going to happen, for two reasons. Firstly, 65 years is a bit arbitrary for Rolex. The ‘big reveals’ usually come along when a model hits its half century. And secondly, it was just last year that all of the focus was on the Pepsi GMT, with both Rolex and its sister company, Tudor releasing absolute knockouts. The stainless steel GMT Master II with a ceramic “Pepsi” bezel insert was revealed at Baselworld 2018. 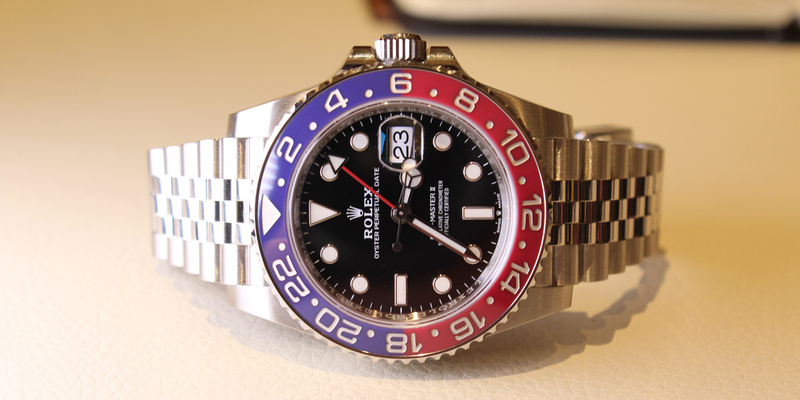 A Rolex GMT-Master with a blue and red “Pepsi” bezel is an icon in the horology world. It was the first example of what would go on to become the most famous, dual time zone watch ever made. Over the more than six decades that followed, the Rolex GMT has always been an option, in one form or another. 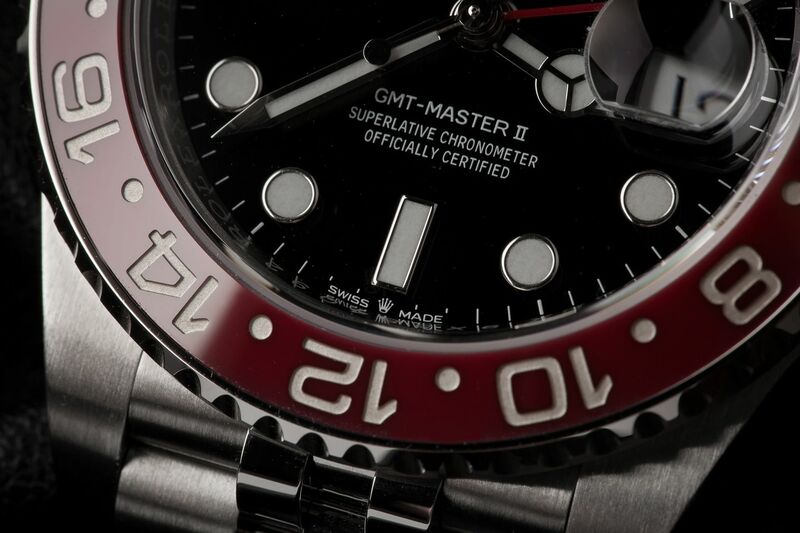 The original Bakelite bezels soon gave way to aluminum, which carried the various GMT references all the way up to 2005. That was the year Rolex introduced their Cerachrom (ceramic) bezel inserts to the model; however they had not yet perfected a method of applying a twin-color scheme to it. Instead, the GMT’s ceramic bezel was issued in solid black, rather missing the point of their intended purpose: to give an at-a-glance representation of night and day. 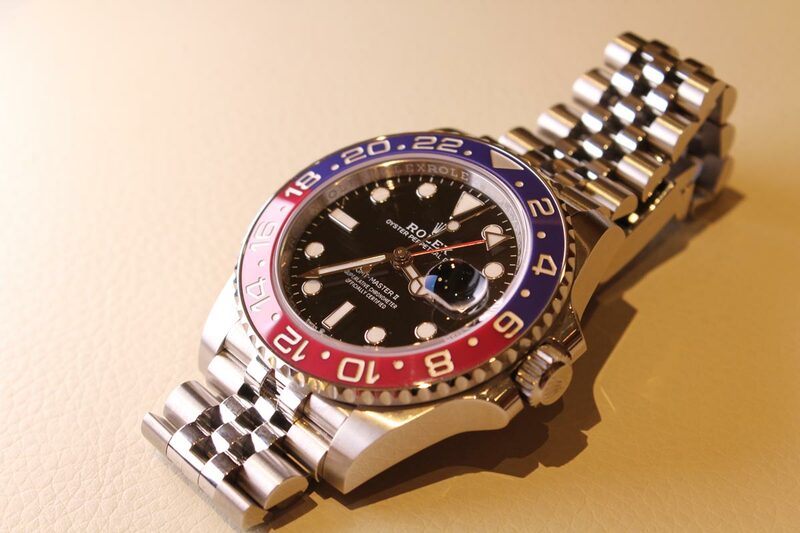 The “Pepsi” bezel insert on the Rolex GMT-Master II ref. 126710BLRO is made from red and blue ceramic with engraved numerals. 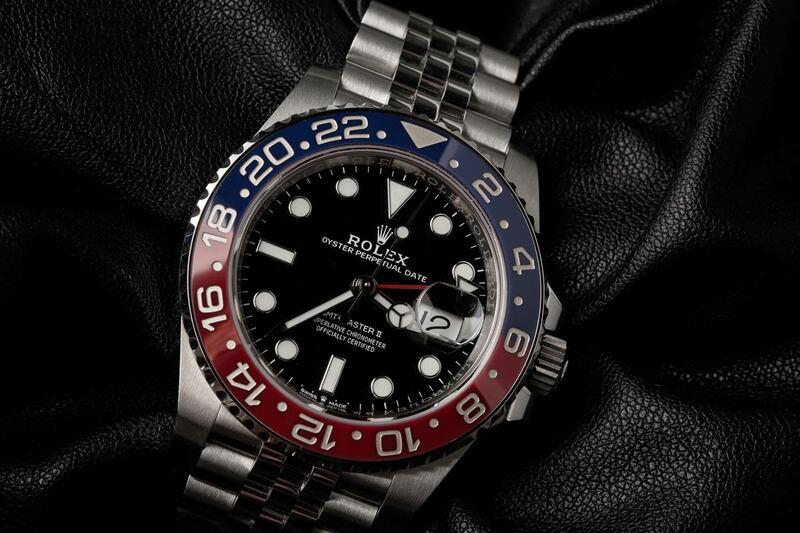 The closest we got to a Pepsi GMT bezel for the next few years was an extremely costly example encircled with rubies and sapphires; however by 2014, Rolex had achieved the method of adding a second color to their ceramic inserts, and a true Pepsi model made its entrance. Unfortunately, it was exclusively fitted to a white gold piece, leaving the legendary watch out of most people’s price range. This is largely why last year’s reintroduction of a Pepsi GMT-Master II in stainless steel stole the headlines for months on end. Nevertheless, the Rolex masterpiece didn’t have it all its own way. Like the little brother always trying to get one up on his older sibling, Tudor rocked up to Baselworld 2018 with a Pepsi GMT of their own. 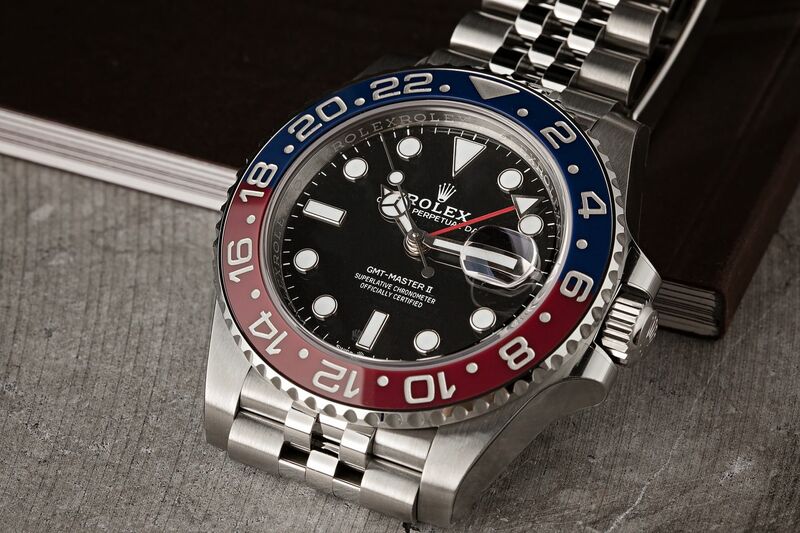 The current waitlist at authorized retailers for the new Rolex “Pepsi” GMT-Master II is already several years long. First off, it is worth saying that having to choose between a GMT-Master II and a Black Bay GMT is not the worst problem in the world. Either way, you are going to end up with a stunning watch and a fair number of envious glances. However, one is going to leave a much more significant hole in your bank balance than the other. 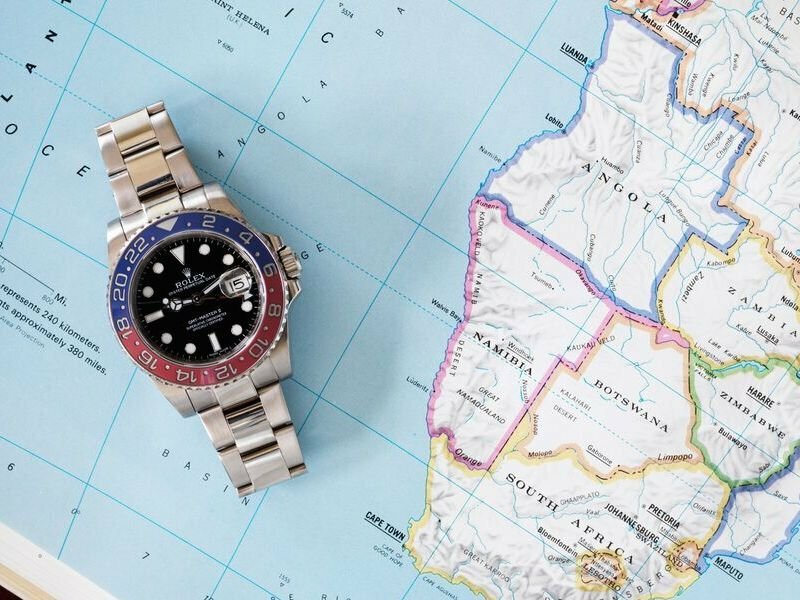 Technically, wandering into a Rolex AD and leaving with a Pepsi GMT-Master will set you back somewhere around $9,250. For the Tudor, you’ll be parting with about $3,900 (for the version on the bracelet). That is already a massive gulf between the brands, but as we reported here a few weeks ago, trying to get your hands on the Rolex at retail is pretty much impossible. The downside of the model’s popularity is, as always, the demand. This has translated into mammoth waiting lists (not helped by Rolex’s policy of distributing as few examples of the watch as possible), as well as pre-owned pieces that have more than doubled the official price. An unworn Pepsi GMT-Master II can now fetch as much as $25,000 at auction, and if you have that much lying around, you could probably stretch your budget by a few extra thousand dollars and get yourself the white gold version of Rolex’s Pepsi GMT. So that leaves us with the question: is the Rolex worth that much more than the Tudor? We’ll look at both pieces in a bit more detail below. The ref. 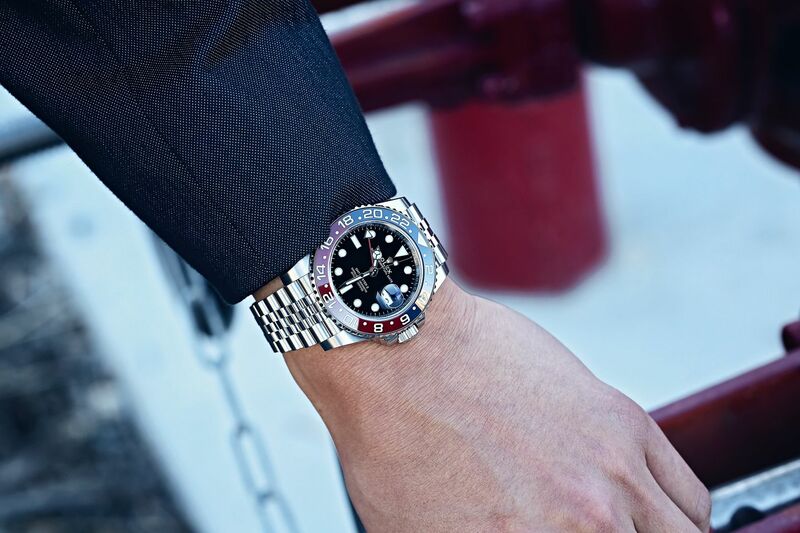 126710BLRO Rolex GMT-Master II features a ceramic “Pepsi” bezel insert and a stainless steel Jubilee bracelet. There is no denying Rolex’s Pepsi GMT offering is a beautiful watch. 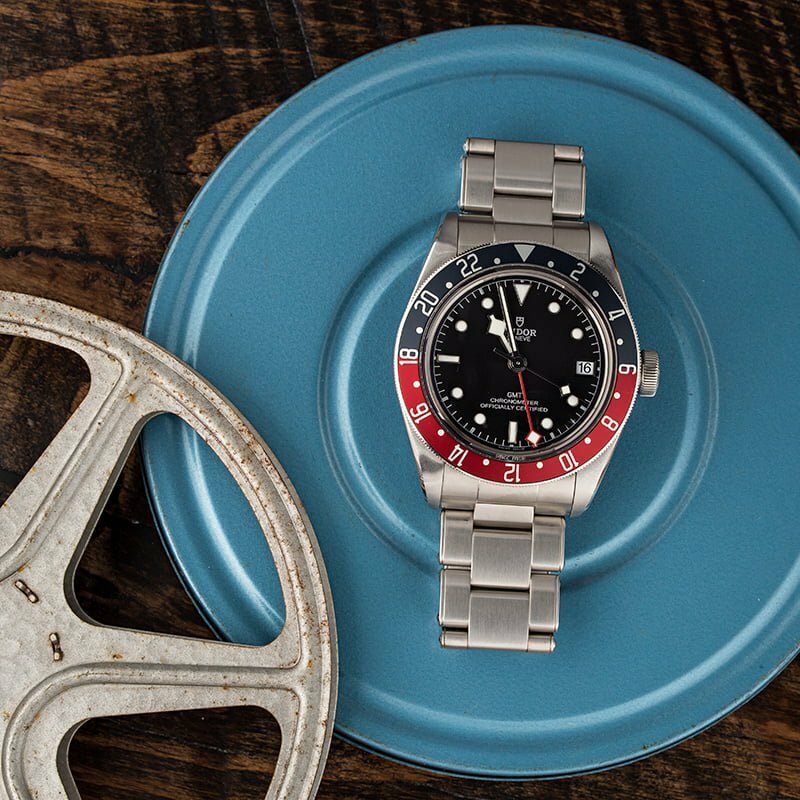 The brand’s use of 904L steel, now known as Oystersteel, gives a shine you won’t find from any other manufacturer, and they have redesigned the 40mm case for the GMT, with the lugs subtly altered for an overall sleeker profile. The change from the classic, three-link Oyster bracelet to the Jubilee raised a few eyebrows upon its release last year; however it helped give the watch a nice retro vibe, as well as helped differentiate it from the white gold model – which could look very similar at first sight. Rolex now also fits the white gold version with a blue dial to distinguish it further, while the new stainless steel model retains the classic black dial. The new Rolex Pepsi GMT-Master II was the most discussed watch from Baselworld 2018. Inside, the Cal. 3285 is given its debut, bringing with it some substantial updates over the Cal. 3186, which Rolex still uses to power other GMT-Master II watches (including the white gold Pepsi version). Most notably, it includes the Chronergy escapement that first made an appearance in the latest movement used to drive the Day-Date, the Cal. 3255. This completely reworked variation on the traditional Swiss lever escapement purportedly gives an increased efficiency of 15%. Like all other contemporary Rolex movements, it is (of course) chronometer certified. But it is the bezel everyone comes to see, and it too has caused some discussion. Compared to the steel bezels of times past, the colors are certainly on the more muted side. In fact, stand up the contemporary model next to one of the very first examples with a nicely faded Bakelite insert and there is a definite parallel. Whether it is “right” for such a modern watch is down to personal taste (I happen to love it), but it certainly hasn’t done anything to affect sales. 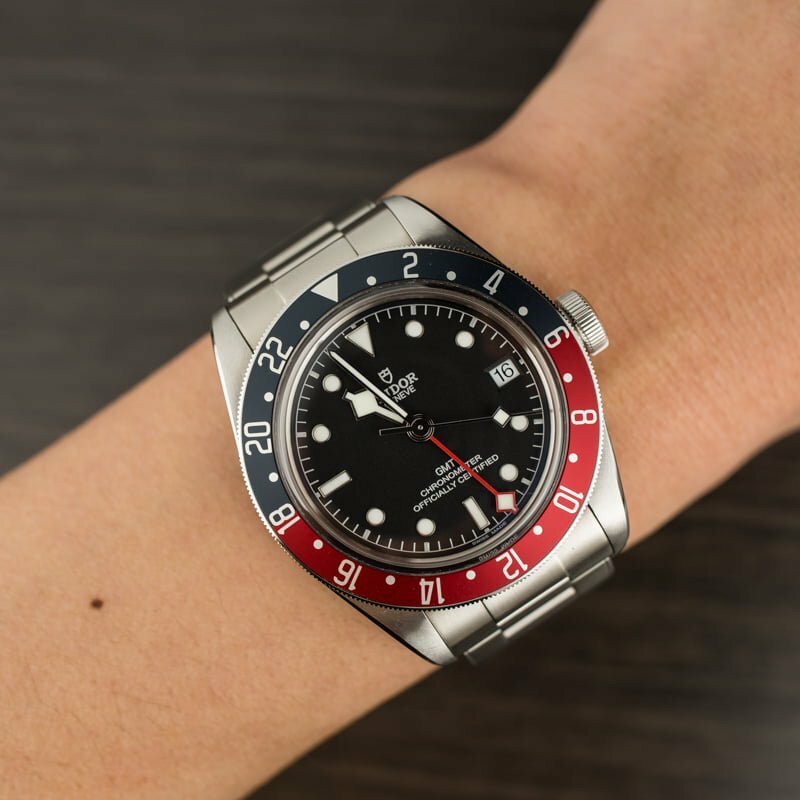 In all, a steel Rolex GMT-Master II with a ceramic Pepsi bezel is just something that should exist in the world (whether or not you are ever able to get your hands on one), and last year’s release answered the prayers of fans everywhere. Don’t expect to purchase a stainless steel Pepsi GMT-Master II anytime soon – unless you plan to pay significantly above retail price for it. If Rolex’s offering dipped its pinky toe into the retro nostalgia, Tudor’s jumped in with both feet. The case is straight out of the 50s archive, elegant and simple, and the absence of guards around the oversized winding crown only adds to the vintage vibe. At 41mm, it is slightly larger than the GMT-Master as well, making it perfect for those who like a bit more wrist-presence in their tool watch. The Tudor Heritage Black Bay GMT has a “Pepsi” bezel insert made from aluminum, rather than ceramic like on the Rolex GMT-Master II. The handset is also going to look very familiar to anyone with a passing acquaintance with the brand. The hour and seconds hands are given the signature “snowflake” styling from 1969, as is the red 24-hour hand. The matte black dial has a railway-style chapter ring, and the bezel insert is no-nonsense anodized aluminum. While that could be seen as a step down from Rolex’s Cerachrom, only the aluminum is going to fade and develop an attractive patina over the years, giving the Black Bay a hint of backstory. Here too, the colors are slightly subdued, with Tudor taking the red and blue hues from their diver’s series range and marrying them on the watch’s 24-hour bezel. The movement may be the most impressive element though. Not so much for its functionality (although it does have a lot to offer), but for the fact that it is an in-house mechanism. Back in the day, the reason for Tudor’s much lower price point (compared to Rolex) was mainly down to the fact they bought their calibers from a third party. Not having to spend money on expensive research and development to build your own engines is a massive cost-cutter, but since Tudor’s return in 2010 – following their mauling at the hands of the quartz crisis – they have been on a mission to develop their own movements. At less than half the price of the Rolex Pepsi GMT, the Tudor Heritage Black Bay GMT ref. M79830RB represents great value for the money. The Cal. MT5652 inside the Black Bay GMT is one such movement. Based on the highly accomplished MT5612, but with a 24-hour module bolted on, it offers a similar three-day power reserve as Rolex’s new Cal. 3285, as well as the same balance frequency of 28,800vph. A typically reliable and accurate workhorse, it even has an anti-magnetic silicon hairspring. This practice of developing in-house movements has very much brought Tudor out of Rolex’s shadow, and they are now no longer seen as the poor relation. They are, in fact, almost comparable in every aspect – except for the price. The new stainless steel Rolex GMT-Master II ref. 126710BLRO comes on a Jubilee bracelet. Which Pepsi GMT-Master Is For You? So the question is, do you buy a Rolex GMT-Master II or a Tudor Heritage Black Bay GMT? Actually, the better question is, do you buy one Rolex or several Tudors and still have money left over? The difference in quality between the two is completely disproportionate to the disparity in prices, that much is obvious. The Tudor is a great watch, beautifully built and steeped in enough period details to satisfy the most ardent purist. In addition, the final piece of the puzzle, the homegrown movement, is present and correct. But the Rolex is the real icon, the one everybody wants – not just now, but in the future as well. That means it is going to hold its value far better, should you decide to sell it at any point down the line. On top of that, it has the edge in both technology and brand image. You don’t have to be a “watch guy” to know about Rolex in the same way you do with Tudor – and that has to be a consideration whatever purchasing a luxury product (whether we want to admit it or not). In the end, it is a matter of personal taste. But in the age-old debate of Rolex vs. Tudor, the gap has never been smaller. The ref. 16719BLRO was the very fist GMT-Master with a ceramic “Pepsi” bezel insert; however it was only offered in white gold.